Just finished this excellent biography of the Prophet Muhammad. 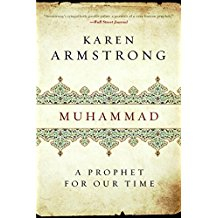 There are so many ways in which he was way ahead of his time: eschewing pre-Islamic Arabia’s “jahiliyyah” (what Karen Armstrong calls the violent, explosively irascible, arrogant, chauvinistic, tribalistic modus operandi of the time and place), in favor of social egalitarianism and “hilm” (forbearance, patience, mercy, tranquility). But unfortunately, in Islam, as in Christianity (also started by a very charismatic leader ahead of his time), what the prophets started so well has spun wildly out of control in much of the world, over much of history!